Four years ago, as the ghastly slaughter of rhino’s by poachers in South Africa by scaled new heights, TCI with the help of our patron Dr. Ian Player produced a film documenting the tragic circumstances facing South Africa’s Rhino populations. The film “Rhino in Crisis””: A Blueprint for Survival” https://vimeo.com/135540882was screened widely in South Africa, distributed overseas and featured the views of a wide range of scientists and wildlife management experts collectively representing a formidable body of experience in sustainable use wildlife management practices and visionary economic principles . The film and the ensuing battle between pro and anti trade lobby’s leading up to the CoP17 in Johannesburg duly took place with brave eSwatini ( then Swaziland) the only African range state to submit a formal proposal for an amendment to the appendices to allow a legal trade in rhino horn. Sadly that bid failed, defeated at the subsequent formal poll among member states. One cannot help but cringe in speculating what Ian Player’s reaction would be , were he alive today, to learn that losses to poaching in what are generally accepted as fortresses of protection, have more or less doubled to reach a total somewhere in the region of 8000 animals : 8000 rhino – the figure is staggering if for no other reason than it represents 44% of our present South African population ( assuming official statistics are accurate which for good reasons, is doubted !). Do the maths ! We can expect only a remnant to survive if we project this trajectory of loss over the next eleven year cycle. What legitimacy is there in such a yardstick? Well, both the 40 year old CITES ban on trade in legal horn, and the industrially expensive anti poaching measures it has spawned, have simply failed to arrest the slaughter – about 1000 rhino per annum – not to forget the loss of human life. Nature conservation was never intended to involve the killing of people. So given this performance who, other than the very naive among us, would bet against Cerathotherium simum simum being on track to suffer the very same fate as befell two other African rhino species – both lost to mankind – under the same CITES trade ban. Ian would have been devastated by this blow to the universally acclaimed project – saving the White Rhino from extinction – in which he played such a prominent role. It stands without equal in the annals of endangered species conservation and involved not only translocating rhino to other parks in Southern Africa but equally importantly selling rhino to overseas safari parks and, note, the private game ranching community, now the owners of some 7000 rhino’s. How does this threat to South Africa’s Rhino populations maintain its momentum in the face of such dire evidence of the bans abject failure? Generally speaking opponents of a lifting of the ban fall into two distinct categories; a broad, largely inactive collective who find Chinese lust for horn abhorrent and uncivilised on one hand , and on the other, the more actively vociferous Animal Rights NGO’s whose mantra of strict opposition to any commercial use of such an iconic species is driven by well financed propaganda directed at all levels of society both locally and abroad. Meanwhile a number of mainstream conservation NGO’s have remained curiously reluctant to follow through and back legal trade in horn as a legitimate expression of the guiding principles of international conventions relating to sustainable use of wildlife resources. Just how effective this opposition to trade has proven can be measured by the fact that the 40 year old ban continues to enjoy credibility in spite of its dismal failure to achieve its basic intention – advancing the survival of the species. How can this be and why is it that a legal trade in horn operated through a regulated market derived from a technique which does no harm to the producer rhino remain untested ? Not only does it represent an anti -poaching weapon, one capable of reversing the appalling rate of loss. It also has the added advantage of generating a sustainable flow of revenue to strained state and private sector conservation coffers not to overlook the potential benefits which would accrue to impoverished rural human communities – for historical reasons excluded from the thriving commercial wildlife industry. What rationale anchors the anti trade lobby? Entrenched in a muddled torpor of belief in an idealistic conservation ideology, seemingly blind to the challenges facing biodiversity management in an unforgiving world where socio –economic imperatives ride roughshod over moralistic protectionism, its chooses instead to ignore the facts in favour of backing an ineffective policy. All the evidence points to poachers and the criminal syndicates they work for operating in a kind of continuum, with no end of recruits, outwitting authorities and constantly devising new means of gaining access to a scarce, high value commodity. “Demand reduction” is the anti-trade handmaiden, touted as the new final solution to poaching, a concept heralded as the ultimate solution. Well, it hasn’t worked – one needs only to look at the poaching numbers for confirmation. Worse, the danger exists that demand reduction may be even acting perversely to render rhino horn evenmoreprestigious and desirable in the consumer countries. As an experienced economist explained recently that “demand reduction” is a “black hole”, a concept completely foreign to normal market forces. Ian Player was a complex person with a pragmatic repertoire of beliefs in wildlife conservation, some seemingly in conflict with his image as thechampion of wilderness as an integral part of protected ecosystems. Take for example his patronage of hunting associations, his advocacy of sustainable- use practices in protected area biodiversity management and his support for private sector engagement in commercial wildlife operations. Ian may not of personally relished recreational hunting, culling, as a means of retaining biodiversity values in finite protected areas, or managing rhinos for horn ; but he stood by the harsh realisation that these were concessions necessary to equip conservation with the weapons to fight against the loss of wild places and the biodiversity they represent. So I ask you – watch the clip featuring Dr Player as he gripped, knuckles white, the arms of his chair back in 2014 and exhorted CITES and the world to apply common sense and trade in horn. As we begin a new campaign, “ Legal Trade for Rhino Survival” in preparation for CoP18 in Sri Lanka, let us be mindful of that ringing appeal to the world, carpe diem. 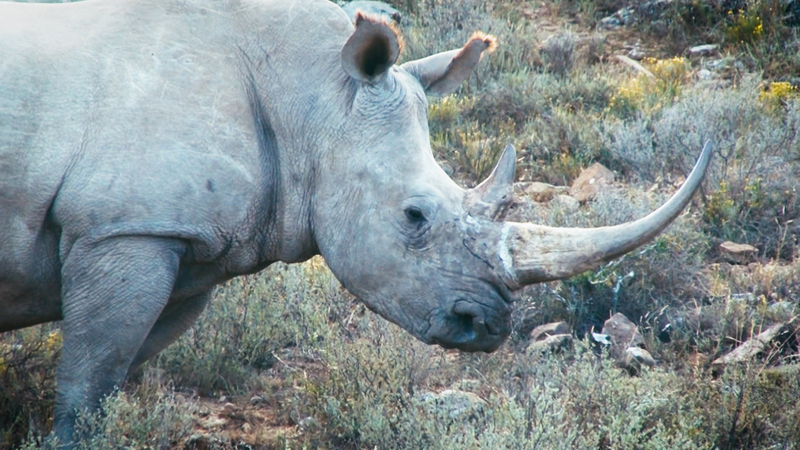 problem of conserving rhinos; while director of the Umfolozi Animal Reserve managed the notorious Operation Rhino, which saved the remnants of southern white rhinoceroses. On 7/3/2018 we read the excellent article by Dr. Georges Hughes. It is necessary to remove the curtain that hides the good conservation actions. No one will say that we will not face challenges to legalization of trade, but problems such as: whether trade is well controlled or not, if the whether or not the level of corruption can be reduced, whether there is an increase in poaching, whether the mafia currently controlling demand and supply will continue, whether the price will be manipulated and the market will continue more of the same and so on; all this can not serve as an impediment. Fear and mistrust can not dominate attitudes. Legalization will provide a new landscape, where rhino conservation will generate funding. Public, private and community initiatives will multiply. There is no doubt that legalization will promote its quantitative increase. Its conservation will have commercial value. Conserving rhinos demands a prohibitive budget today for many reserves, since budgets triple / quadruple when rhinos are introduced. Only militarism guarantees its survival today. We are today, both in the media and in social networks, flooded with thoughts, ideas and ideologies that, although they seem to enjoy good conservation actions of rhinos, are composing the current situation. Sustainable, responsible and rational conservation based on commercial use counterposes providing a new road towards a new market ordering. For more than five years we have counted more than 1000 rhinoceroses dead per year, dehorn is painless and not unethical, it is a pragmatic and sustainable action and is within the reach of all countries that have them. When it comes to rhinos, the opinion and history of Dr. Ian Player will never be forgotten.